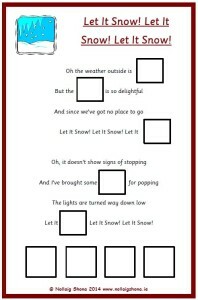 This is a seasonal, fun literacy exercise for junior pupils, SEN pupils or those with literacy difficulties. 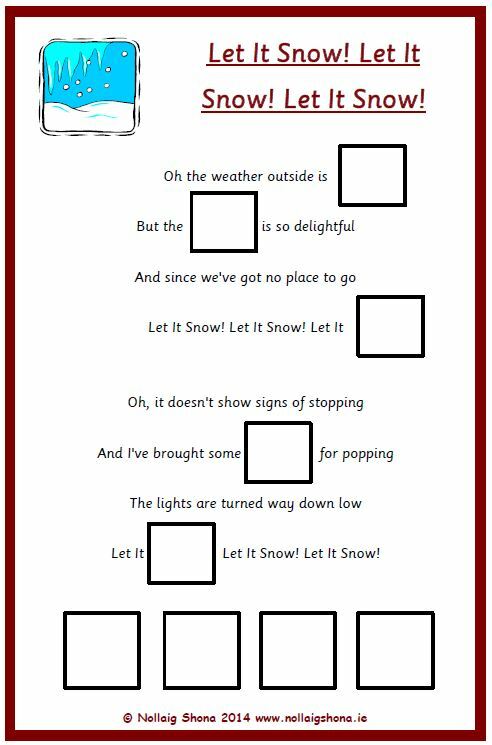 Pupils have to fill in the gaps to complete the seasonal song, “Let It Snow! Let It Snow! Let It Snow!”. Laminate both sheets in this resource. Cut out the five images on pages 2 and adhere them using Velcro to the five spaces at the bottom of page 1. 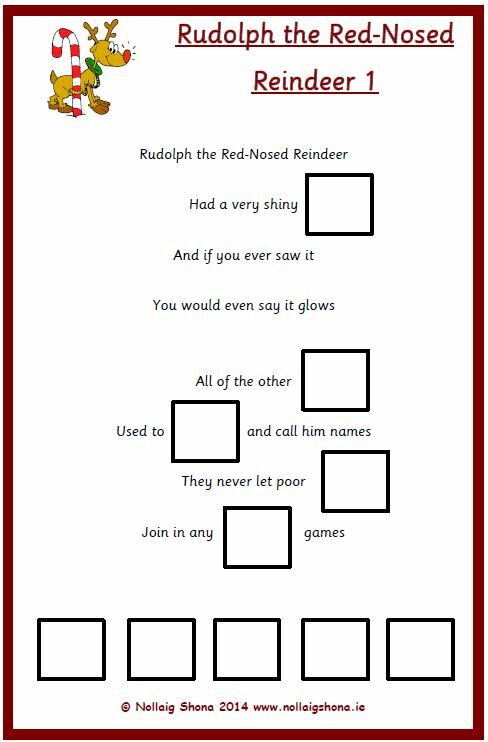 This is a seasonal, fun literacy exercise for junior pupils, SEN pupils or those with literacy difficulties. 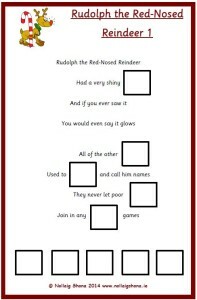 Pupils have to fill in the gaps to complete the seasonal song, “Rudolph The Red-Nosed Reindeer”. This resource comes in two parts. Laminate all sheets in this resource. Cut out the five images on pages 2 and 4 and adhere them using Velcro to the five spaces at the bottom of pages 1 and 3. Place Velcro in the other five spaces on pages 1 and 3. The pupil has to choose which of the images at the bottom of the page complete the song. 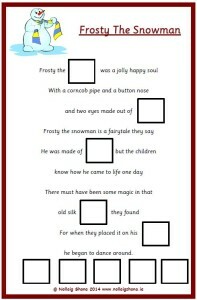 This is a seasonal, fun literacy exercise for junior pupils, SEN pupils or those with literacy difficulties. 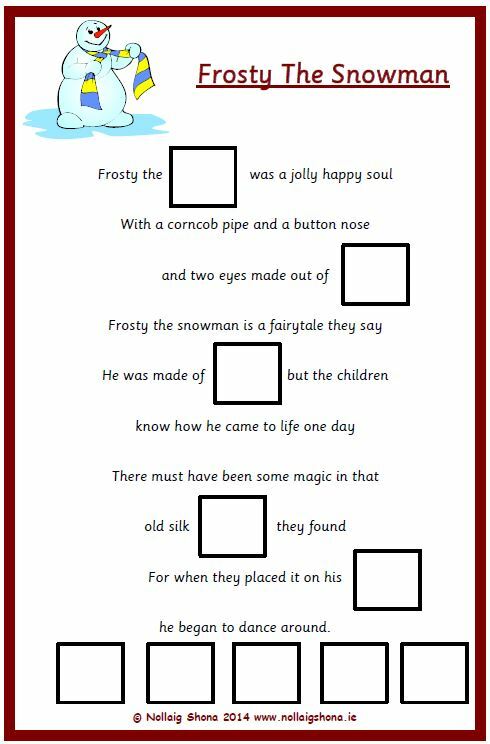 Pupils have to fill in the gaps to complete the seasonal song, “Frosty the Snowman”. Laminate both sheets in this resource. Cut out the five images on page 2 and adhere them using Velcro to the five spaces at the bottom of page 1. Place Velcro in the other five spaces on page 1. The pupil has to choose which of the images at the bottom of the page complete the song. 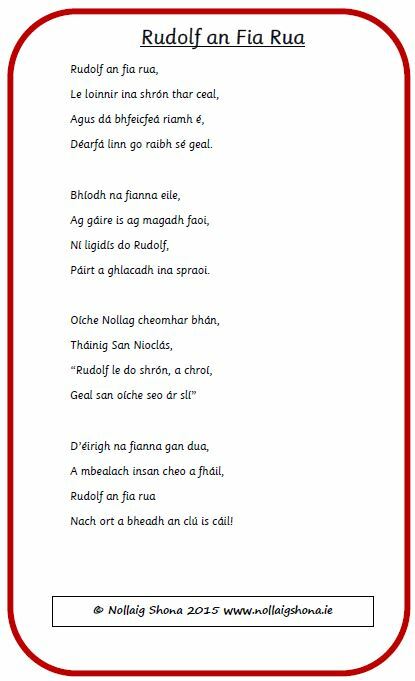 This is a seasonal, fun literacy exercise for junior pupils, SEN pupils or those with literacy difficulties. 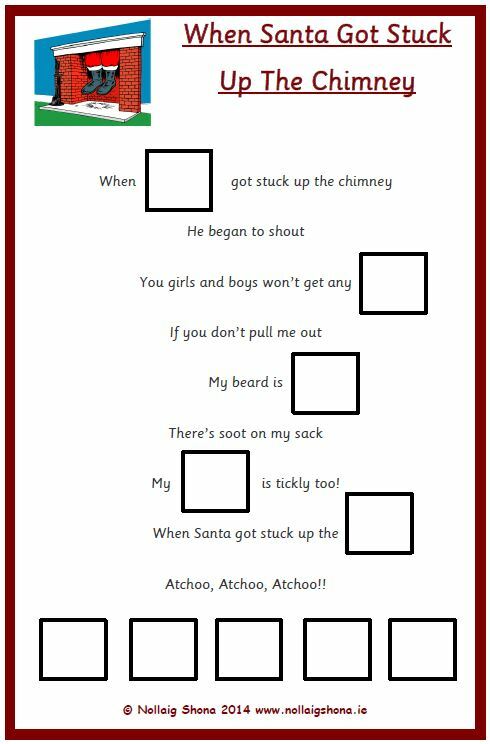 Pupils have to fill in the gaps to complete the seasonal song, “Santa Claus Is Coming To Town”. This is a seasonal, fun literacy exercise for junior pupils, SEN pupils or those with literacy difficulties. 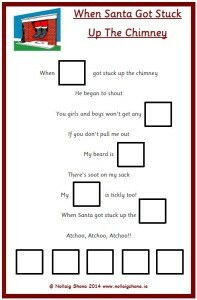 Pupils have to fill in the gaps to complete the seasonal song, “When Santa Got Stuck Up The Chimney”. 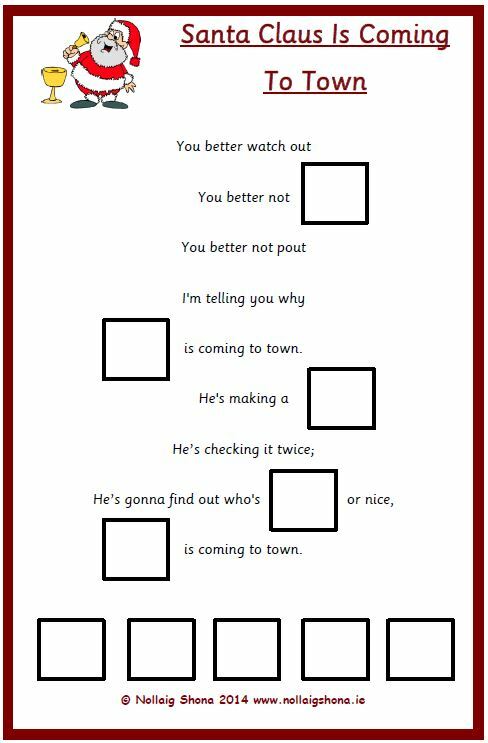 This is a seasonal, fun literacy exercise for junior pupils, SEN pupils or those with literacy difficulties. 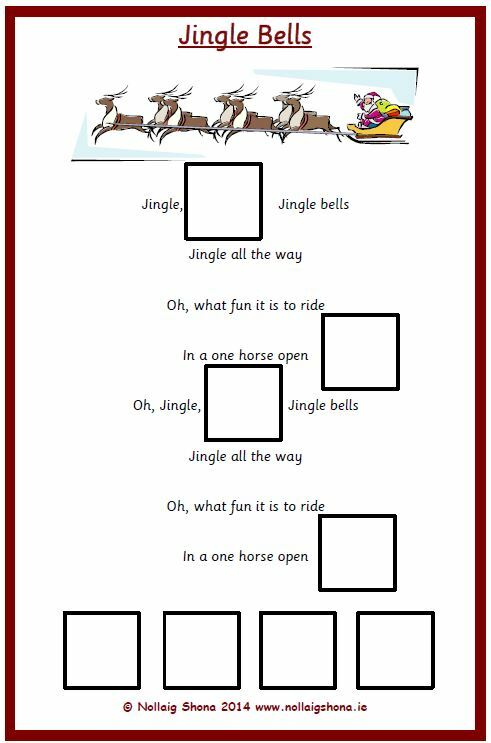 Pupils have to fill in the gaps to complete the Jingle Bells song. Laminate both sheets in this resource. Cut out the four images on page 2 and adhere them using Velcro to the four spaces at the bottom of page 1. Place Velcro in the other four spaces on page 1. 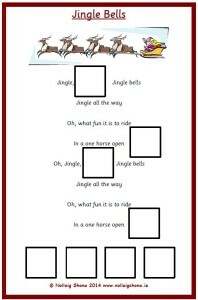 The pupil has to choose which of the images at the bottom of the page complete the Jingle Bells song. This video of the traditional Christmas song, “We Wish You A Merry Christmas” contains the music and on-screen lyrics. 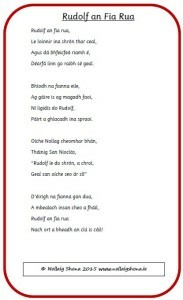 It is perfect for school assembly or in the classroom for the pupils to sing along to.